Do you have gaps in your IT infrastructure resources? Evros delivers a fully Managed IT Service that wraps around your environment, built out across the entire stack. Our capability has adapted to emerging IT solutions over the past five years, enabling you to bolt on additional support services and custom-built support for your on premise environment. Evros delivers support to your environment at each level, from applications to hardware infrastructure. Our consultative-led approach determines what is the right solution for your business. Experience a complete managed solution that delivers right across the IT stack, driving industry-leading support and management of your on premise IT environment. Evros Technology Group has redefined how IT Managed Services should be delivered. The On-site Technical Resource team is supported by a panel of specifically qualified and experienced engineers in niche-area technologies. This service can be arranged for resources with a required skill set to work on specific projects or provide ongoing operational support for a set period of time. The Network Infrastructure Service provides operational technical support on all your identified network and Wi-Fi infrastructure, from various manufacturers outside of the connected Evros network. Our team of Monitoring Engineers and Event Analysts ensures the rapid response and remediation of key issues before they become incidents. The Evros monitoring and alerting service provides a real-time, in-depth view of your environment which enables the proactive identification and resolution of threat, ensuring a prompt response to assist in maintaining performance, capacity and availability. Our Service Desk is the first point of contact for immediate response, continuously focusing on the needs and priorities of our user. The team will triage, mitigate and resolve and in the event of a require escalation, we will gather information to allow for rapid solution response. The Systems Infrastructure Service delivers your daily system administration tasks and management on the cloud solution, with a wide array of skilled resources to maintain performance, capacity and availability of your environment. Our Support Service team will triage, diagnose and repair all ICT assets outside of the Evros environment, including dispersed office locations. The Backup and Replication Support Service provides operational technical Backup support to clients on your own identified environment. The service monitors, manages and supports your environments and backup and replication related issues. The Application Support Service provides the skills needed to support and administer the business applications utilised by end users. We provide management, maintenance and support to defined applications that directly underpin business services. The Patch Management Service provides updates to all Windows servers during monthly schedules. The servers will be grouped based on their role within the customer environment. This grouping allows Evros to patch non-critical and critical Windows infrastructure in a controlled way, ensuring stability to the production environment. 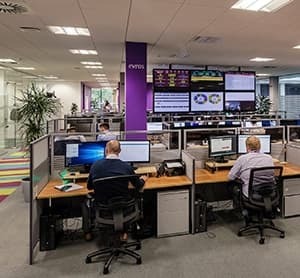 ”Our Managed Service offering delivers seamless management and support of your entire mission-critical ICT infrastructure, optimised and resilient 24x7x365 from our state-of-the-art NOC." Interested in our award-winning ‘Managed Services Company of the Year 2018’ solution?